They are back and it feels so good. Re-entering the gloomy lives of Tandy and Ty felt just as good as expected. 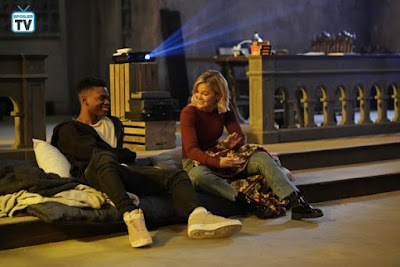 Cloak & Dagger was one of my favorite new shows last year and made my summer so much better. This year Tandy and Ty entered the game a bit earlier and brought back all their heavy and captivating angst along. Episode one was quite smooth. Not pushy but with not a lot of plot unfolding but entering Tandy`s and Tyrome`s worlds from a whole new side. Tandy was trying to live a "normal" life. Adjust and live peacefully with her mother. They even go to group therapy together. Digging deeper in the abuse story and the bond between her and her mother. Tandy`s story is all about healing and one thing Tandy needs to realize its a marathon, not a sprint. But the writers know that so we are fine at the moment. Tandy`s return was another nicely played card on the writer`s side. It is part of Tandy`s healing and reintegration. Meanwhile, Ty tried to make something out of his life. The hiding out in the church for 8 months was certainly taking a toll on his psyche. Yet he tried to play it cool in front of Tandy. Her saving his behind was such a worthy moment. They know each other so well. And it was palpable during their scenes. Ty ghosting his whole family and mastering his powers to do good felt very sweet. I appreciated that they didn`t make him undefeatable and flawless. He has to mistakes on his way to greatness. The scenes where he was shadowing his family were heartbreaking. 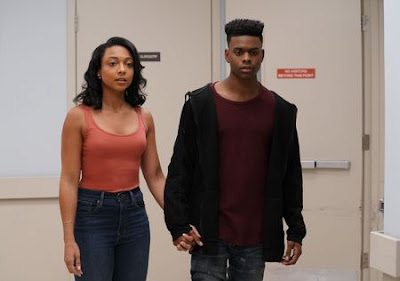 One of the things this show did Oh so well during season one was the connection between Tandy and Ty. And this season seems like they are continuing their great streak. The chemistry between Olivia and Aubrey is captivating. The writers know those two so very well and the writing is so smooth and convincing. Them watching old movies together and just being there for each other makes this show worth watching. Tyrone carrying enough to go and apologize just shows how much they mean to each other. The pre-club and club scenes were very entertaining. Then being able to just be chill and themselves around each other shows how far along their relationship has gone. The gang meeting ending in such a bloody was expected but gosh what a mayhem just went down there. The background score for this outing was impeccable. Major kudos to the music division, they have outdone themselves. Every single song was perfectly chosen and placed. Thank U. Episode number 2 had a lot more dynamic. The fallout after the gang mayhem has split into 3 stories following our three main characters. After the season 1 cliffhanger, I was quite sad that they would completely villainize my perfect crime fighter, Bridget. 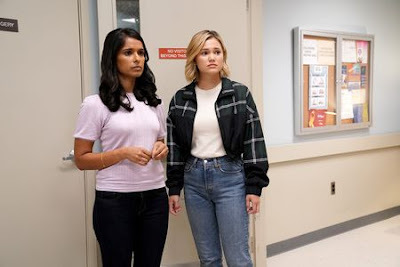 The shocking revelation that the accident of the season finale produced another Bridget who will presumably be this season`s Villain and take up the mantle of Mayhem had me in stitches. I was expecting a split personality twist but this is a way way better way to take on this story. 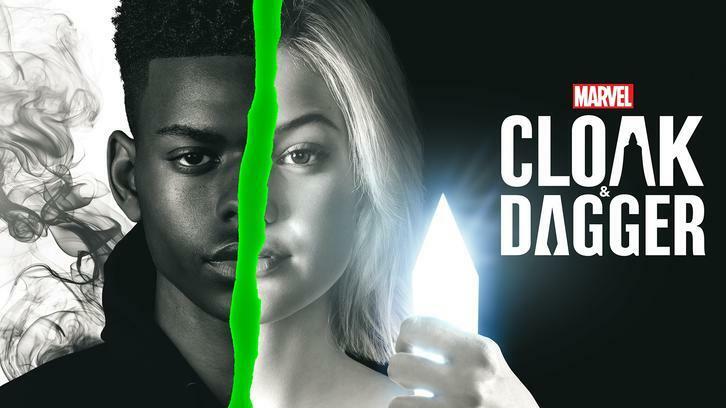 The clues of a "split" personality were layered very slowly but I wasn`t even sure they would go that route or just make Bridget a two-face crazy biatch. The murder spree in the club happening when only she knew about it was my biggest giveaway but also the way she handled that investigation. Covering it up too smoothly. Should be interesting to see which path the writers will take with Bridget and Mayhem and how that backstory will unfold. Ty`s main take off from the shooting, was that Buddhist sign that let him back into Evita`s arms. And while I ship T&T with my whole body, Ty and Evita`s connection has its own charms. Noelle Bercy has phenomenal screen presence and her energy clashes so well with Ty. Their scenes carry this first love innocence makes you wanna hug them and keep them safe from anyone trying to hurt them. She searching him out and supporting him despite keeping his status hidden from her was a big move and showed how great a person Evita is and how much she cares about Ty. She teaching him how to teleport someone along was very sweet. It was about time for Ty to accomplish it. and as the only humanly possible response. But the explanation from Dilshad Vadsaria`s Lia made a lot of sense. The only thing Tandy succeeded with that reaction was making Mikayla feel uncomfortable at the only place she should feel safe. Also, I appreciate the bonus of having Dilshad on my screen. But she wasn`t coming alone. She also introduced Brooklyn McLinn`s Andre into the lives of Tandy (and Ty). Andre is a very charismatic character. He introduced a new world to Tandy and new injustice she seems to have chosen to resolve. The background of these missing girls is intriguing and I am excited to see where the writers will go with this story. That`s a wrap on my side guys. What are your thoughts on the season 2 double premiere? Vote in the Poll below and share your thoughts in the comment section down below.